Links | Brooklyn (CT) Youth Soccer, Inc. The Canterbury Athletic Association manages the recreational youth soccer league in Canterbury, Connecticut. The Connecticut Junior Soccer Association, the governing body for Connecticut youth soccer. The Killingly Youth Soccer Parents Organization manages the recreational youth soccer league in Killingly, Connecticut. The NECONN Soccer Club that manages the recreational youth soccer league in Thompson, Woodstock and other sister towns in northeastern Connecticut. The Plainfield Soccer Club manages the recreational youth soccer league in Plainfield, Connecticut. 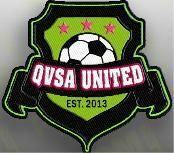 The Quinebaug Valley Soccer Alliance (QVSA) is a regional competition level soccer program in the area. The level of competition is for those kids who have excelled at the rec level and are looking for an additional challenge. Competition teams are tryout teams and the commitment for those who make a team is one (1) year. For additional information on playing or coaching, follow this link. The official home page of the Connecticut referee program. Find certification and educational information here.